A significant number of hours are taken in organising staff and producing the necessary paperwork to function as a service or repair business – iManage replaces this wasted time with trackable electronic Job sheet processing, remote staff management, and financial and stock control. 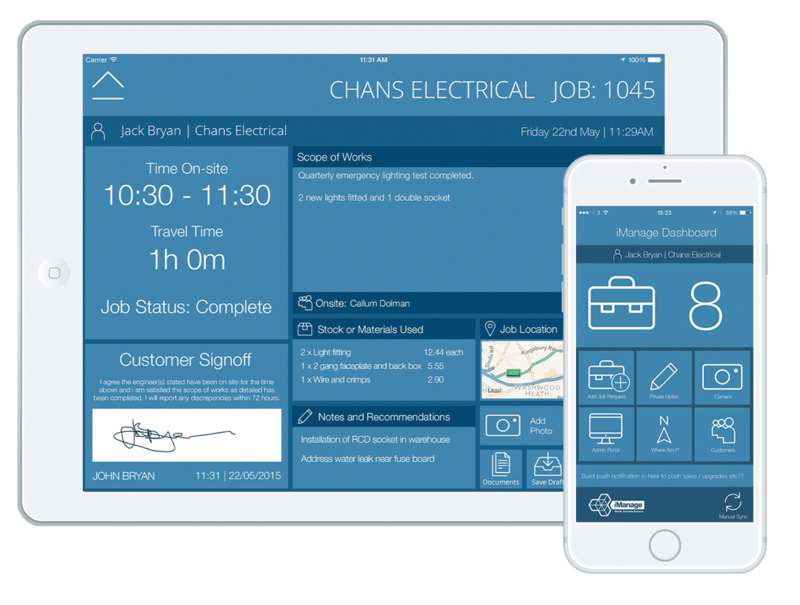 Signable worksheets, live push jobs to engineers, live and historical tracking of jobs and engineer locations. Installation, service, and maintenance jobs are all easily completed via the iOS app on your iPad or iPhone, which then can be instantly viewed on our fully Windows and Mac compatible system. Used by; Service Engineers, Electricians, IT Support Companies, Plumbers, Kitchen Fitters, Air Con Installers, Education, Care Homes, Gas Fitters, Decorators, Mechanics, and more. iManage lets you know where an engineer is, or was last Thursday. Job sheets have always bee the core of iManage features. When we the original iManage Application was created back in 2011, completing a signed, tracked, mobile job sheet and having it immediately accessible from anywhere in the world was unheard of. Having an iManage powered business ensures work sheets are accessible 24/7 via your secure web portal. This prevents them from being lost, allows on-site signature capture for instant job confirmation, and enables location tracking; giving you real-time information on where your engineers are so you can allocate jobs much more efficiently. Historical data means that you can also trace your engineers’ movements from previous weeks – you have full control. The fully secure dashboard is where you go after login, giving you an immediate overview of your business - all the features are just a click away, and the critical information is visible on one screen. With activity feed, you can see recent jobs, quotes and invoices, and view statistics. Along the top of the Dashboard, you'll see an overview from the four core areas of iManage beginning from the first of each month. These include total jobs completed, total hours completed, the total value of all issued quotes and the total amount of all invoices issued. iManage does everything your service business needs. Hover over the boxes below to read a brief description of each feature. Create and send jobs via your dashboard (or on the device directly) to your remote staff who can complete job sheets, record and track time, add notes, attach pictures and drawings, detail stock supplied and get it all approved with onsite customer signature capture. Create quotations, invoices, and send to clients as personalised PDF's plus whenever a job sheet, quote or invoice has been read, you will be notified in your dashboard. Get rid of those clients who constantly tell you they haven't seen the invoice or job sheet as a way of delaying payments! As well as the ability to live push jobs out to individuals. You can create groups - ie first fix, second fix, support etc and instead assign jobs to a relevant group. The job will appear on all that group members devices until an engineer claims it, at which point it removes itself. Once a job is complete and all labour time and materials supplied have been added, your engineer hands their iPad or phone to the client to obtain a physical signature of acceptance. The jobsheet is also geo-stamped with time and location to avoid fraudulent entries. Usually onsite work requires the supplying of goods or consumables. iManage comes with its own internal product management feature - so you can ensure your clients are charged for parts used on the job. Although the dashboard is complete with everything at a glance, we have included an 'Activity feed' which is a live running data logger of everything that's happening within your business. This ensures nothing gets done without you knowing about it! We have proven documentation from multiple clients that using iManage has improved their cash flow. The combination of trackable documents, instant delivery, live job and engineer management give you instant improvements in all areas of your business. Get your own version of iManage with a personalised central dashboard to organise jobs, quotes, track engineers, invoices and other activities for only £50 per month. Then add extra personalised iOS app licences at just £10 per month. Your digital, iManage app will soon be earning money via improved efficiency, cash flow, and improved customer relations...Ditch the paper and pick up iManage.